The ultimate Strictly boy band of dance bring their spectacular show to London’s West End from February 2019. A huge success for the Strictly celebrities, Rip it Up – The 60s brings the decade smashing into the 21st century through an explosion of song, dance, acrobatics and amazing visuals to celebrate the most revolutionary cultural period ever in its first ever West End run, opening at the Garrick Theatre for four months from the 7th February 2019. Following a highly successful 2018 UK wide tour, McFly’s Harry Judd, JLS’s Aston Merrygold and Olympic gymnast Louis Smith, will be joined in London by The Wanted’s Jay McGuinness and are paired alongside an incredible cast of dancers, singers and the Rip it Up live band to entertain with a psychedelic mix of music, style, culture, and fashion. With Aston and Jay singing, Harry on drums, and Louis performing the amazing gymnastic feats that made him one of our most successful Olympians, at the beating heart of the show is the fab four’s phenomenal dancing talent. 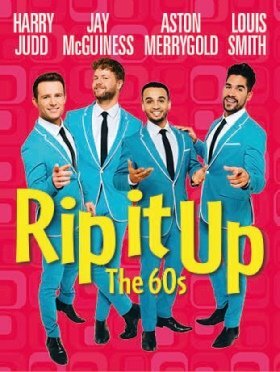 Following the hugely successful 2017 tour Rip It Up – The 50s Jay McGuiness returns to the Rip It Up family and joins Louis Smith, Aston Merrigold and Harry Judd in the West End next spring making up an awesome foursome. Formerly one-fifth of The Wanted who celebrated worldwide success with hits such as All Time Low and Glad You Came, Jay stole the hearts of the nation as he took to the dance floor with professional partner Aliona Vilani to become the 13th champion of Strictly Come Dancing in 2015. Jay says: “I’m really looking forward to joining the cast as the undoubtedly best-looking member! Louis, Aston and Harry put on an amazing show touring with the 60s and I’m so grateful to be joining them. I can’t wait for me and the lads to sit right in the middle of the West End and Rip. It. Up”.